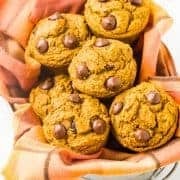 These chocolate chip buttermilk muffins are far less fattening and decadent than they sound, but just as delicious. Carbs? Completely necessary to every great brunch. And this happens to be brunch week if you’re just tuning in. But back to the carbs. Muffins, scones, bagels, pastries, I don’t really care–give me one of each. Bonus points if they have chocolate, which these muffins do. 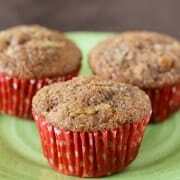 Now, you could make some healthy blueberry bran muffins, or fun biscoff chip muffins, but who doesn’t like CHOCOLATE?! Plus, this is a great way to use up that buttermilk you have in the fridge. You know it is in there. It always is. You don’t have to feel completely guilty about these muffins, though. They are made with yogurt and whole wheat flour so they are definitely skinny-jean friendly. And of course, they still taste great! The recipe I was inspired by, from Erin of Dinners, Dishes, and Desserts, called for vanilla yogurt. I used a mixed berry Greek yogurt because I thought it would taste great with the chocolate. You could taste it if you tried reallllly hard, but it wasn’t an overpowering flavor. Don’t be scared to experiment, but I wouldn’t recommend using something like key lime yogurt. But hey, if you really want to, I’m not going to stop you. To each their own! As a side note, I cannot wait to try this buttermilk banana bread recipe from Today’s Creative life! 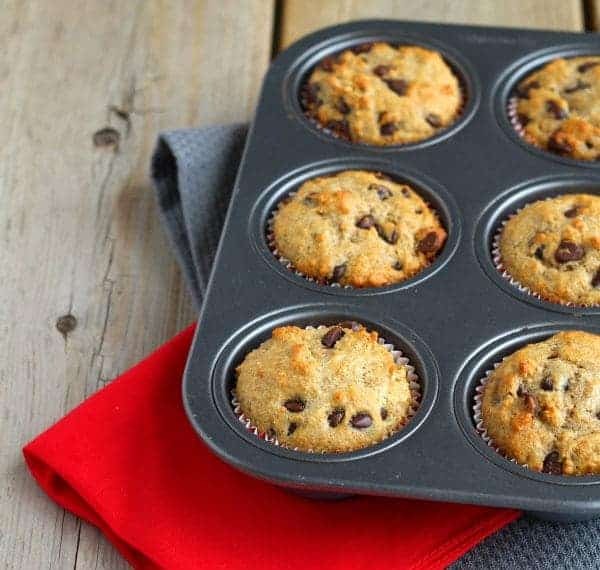 Prep 18 muffin cups with liners or non-stick cooking spray. In a medium-sized bowl, whisk sugar, buttermilk, yogurt, oil, egg and vanilla until combined. 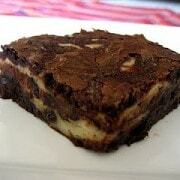 In a larger bowl, whisk together flours, baking powder, baking soda, salt, and chocolate chips. Add the wet ingredient mixture to the dry ingredients and mix just until combined. Do not overmix. Fill the muffin tins about 2/3 to 3/4 of the way full. Bake for 15-18 minutes or until golden brown. Cool slightly before removing muffins from muffin tin and cooling completely on a wire rack. Verdict: Loved these muffins. Rich from the chocolate with great texture from the whole wheat flour. Husband’s take: I think he may have called these the best muffins he has ever had. And E, well, she was completely obsessed. Obviously. There are chocolate chips involved. 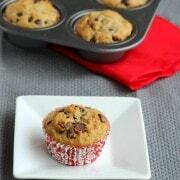 Remember to head to Monday’s post–Hibiscus Pear Brunch Cocktail to go with these chocolate chip buttermilk muffins! Those look so delicious and healthy too! 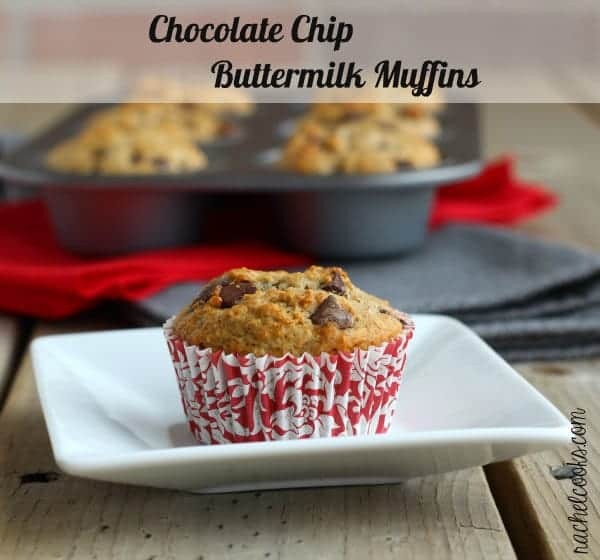 Love using buttermilk in any baked goods, so tasty!! SO wish I had one of these with my coffee for breakfast right now!! These muffins = perfection. I’m pretty sure I would eat one for breakfast every day if I could! Haha, I always have buttermilk in my fridge too. And chocolate for breakfast? Sign me up! I figured I wasn’t alone in that! I hate throwing stuff out. These deifnitely round out the brunch, Rachel. :) I love chocolate chip muffins. I am always ready to hop out of bed if chocolate is on the breakfast menu. Thanks Sally! Wait until you see what is coming today! Brunch is not complete without dessert…. What a yummy batch of muffins! These look delish! I’ll admit it: I do always have a half used bottle of buttermilk in the fridge. This is a nice alternative to using it up on pancakes or biscuits. I think muffins are a must for any brunch! I NEED to try these! What yummy treats! Ohh I think I have all the ingredients for these! SCORE! Nice! Hope you like them! Thanks for linking to me! 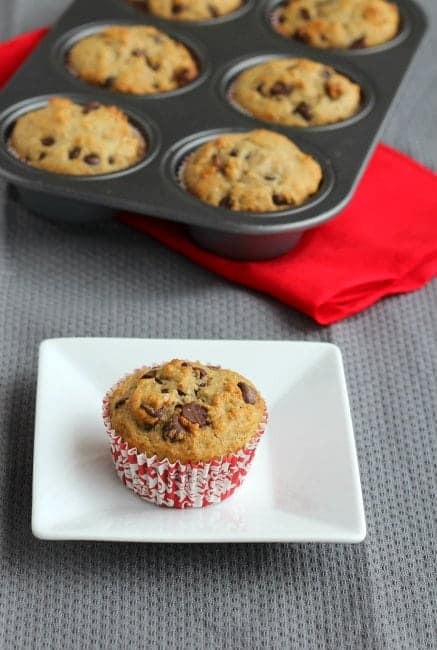 Your muffins look perfect, and a great idea to switch up flavors of yogurt! Of course! Thanks for the great recipe! My mom would love these for mothers day! They look awesome!